In conversation, a friend of mine once coined the term “fauxstalgia” – or when one feels nostalgic for something they weren’t technically alive for. 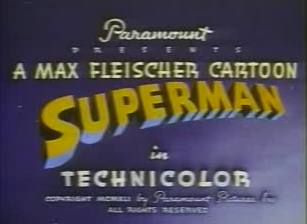 For me, nothing inspires this feeling like Max Fleischer’s Superman cartoons of the 1940s. These 17 monumental shorts featuring the daring (and sometimes war propaganda filled) exploits of Superman and Lois Lane, each beautifully crafted, were quite possibly as instrumental to the takeoff of the superhero phenomenon as Action Comics #1. From these, the standards for what a hero should be were set. These film reel cartoons also birthed a new respect for the field of animation, inspiring artists to this day from Bruce Timm (who based Batman: The Animated Series on these shorts) to master anime craftsman Hayao Miyazaki. Not to mention how instrumental it was to the Superman mythos itself: the above monologue, the “It’s a bird, it’s a plane” exchange, “this looks like a job for Superman,” and “truth justice and the American Way” all find their births right here. Without these cartoons, we never would have seen George Reeves’ Adventures of Superman television show of the 1950s, never have been graced by Christopher Reeve’s redefining Superman of the 1970s- really, without this DC Comics loses its entire foothold in the film and television industry. At the end of the day, it all comes back to Superman. And because these cartoon reels, originally shown in theaters in an era where the television set was not yet a household item, are all now in the public domain, freemoviesonline.com has each of them available for your enjoyment and edification. From The Mad Scientist to Secret Agent, you’ll be glued to your seat with childlike wonder. Even if you don’t happen to be a child of World War II. I had no idea these were so well crafted. It took a second for it to sink in that these are actually from the 40s. Watch one of these, and then an episode of Batman: The Animated Series. Pay attention to the scenery. The influences are readily apparent. yeah, I can really see what you’re talking about. I think I saw an interview or special features where they talked about how Batman’s world is what it would be like if the world fairs just kept happening, and that style stayed and grew. My wife had arrived from your South, so I what food was in good hands. His fee was 110 guineas, understanding that of the hotelkeeper was 30 guineas. two miles distant, and discovered about fourteen Chinamen camped there. Love those old cartoons from the 40’s and 50’s. from good Irish families. They had arranged some signals between themselves. s a dark side to the rise in popularity of digital content, and that. by making use of postures, gestures, and facial expressions. long term project mentioned previously by the organization Piratbyr. It reminded me somewhat of Italian artist Alberto Ponticelli (who, coincidentally, is drawing the IDW miniseries Godzilla: Gangsters & Goliaths).